These cookies aren't all that different from your basic oatmeal chocolate chip cookies but it's fun to put a little twist on things, and all the better when I get to add extra chocolate/cocoa into a recipe. 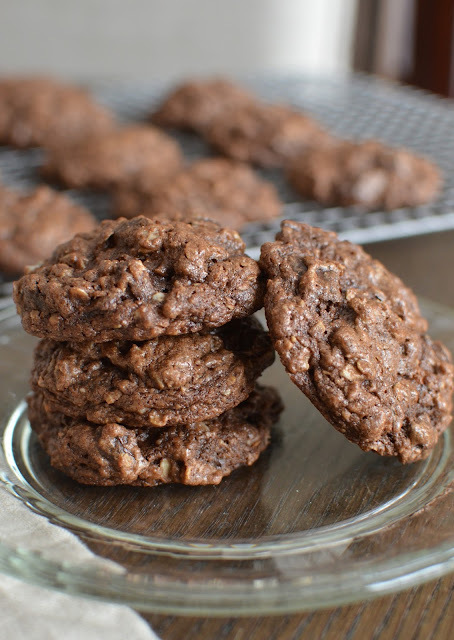 A full spoonfuls of natural cocoa powder transforms our usual oatmeal chip cookies into double chocolate ones. It adds a little something, an extra depth, that I really like. As Mel suggests in her recipe post, I used a mix of old-fashioned oats and quick-cooking oats; I may have leaned a bit more on the oat-fashioned kind but I like the sound of a little mix of textures from the two combined. I substituted half the all-purpose flour with white whole wheat, and for convenience, I tossed in ready chopped chocolate chunks. I had these cookies baked and ready in no time. Sometimes, you want cookies and you want them fast! 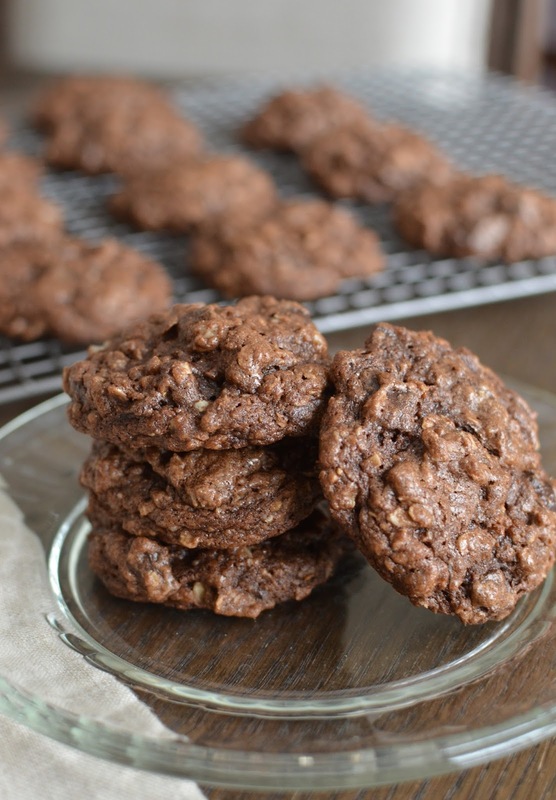 My family and I really enjoyed these chewy double-chocolate oatmeal cookies. I made half the recipe (I usually start with a stick of butter when I make cookies like this) and got 17 smallish cookies. As of publication, all said cookies have been consumed and thoroughly enjoyed! Preheat oven to 350 degrees, with racks positioned in the upper and lower thirds. Line 2 baking sheets with parchment paper or silicon baking mats. In the bowl of a stand mixer fitted with the paddle attachment, cream butter, brown sugar, and granulated sugar together until light and fluffy, 1-2 minutes. Add vanilla and egg, beat together until creamy and light in color, 2-3 minutes, scraping the bowl as needed. In a separate bowl, whisk together the flour, cocoa, baking powder, baking soda, salt, and oats. Add dry ingredients into the batter, mixing on low-speed until just incorporated. Mix in chocolate chips until just combined. Drop about 1 1/2 tablespoons cookie dough mounds onto the prepared baking sheet, spaced about 2 inches apart. Bake until edges are just set and the middles are still soft, about 10-11 minutes, rotating the baking sheets midway. Let cool on a wire rack until cookies set, then remove cookies directly onto the rack. Yeah to more chocolate! These cookies look fantastic, Monica. Oh! Somehow I have never had chocolate in oatmeal cookies...and yes, the more the merrier...thanks for the inspiration Monica! Chocolate and oats? These are my kind of cookie! Double chocolate is perfect for me too! Love the oats in this recipe - and love that I feel like I'm eating something healthier - haha :) Thanks for sharing! I can never resist oatmeal cookies! These look delicious and adding double chocolate just makes these even better! Love how soft and chewy they are! My cookie jar would definitely love to hold some of these! Oatmeal cookies never get old...I'm glad you agree, Kelly! I am with you on cookie making, so satisfying. These are so good, love love the combo, the oatmeal gives such a nice hearty texture. They look perfect Monica. Working in the kitchen on something "simple", that doesn't require a lot of concentration is a great way to relax sometimes. It's interesting because I don't make/enjoy crispy biscuit/shortbread type cookies nearly enough. Each time I have it, I just love it. We tend to buy those for some reason and make these kinds of chewy, soft cookies at home. Please consider adding a Pinterest button to the sharing options. Thank you! Love your recipes! Thanks so much! If you hover over one of the pics with your mouse, you see see a Pinterest button come up on the upper lefthand side. Not very technologically advanced here, I'm afraid...but hope that works for you. Double chocolate double the pleasure! Ha - you summed it up! Oatmeal cookies have been a favorite of mine since I was a kid! And with double chocolate??? Um, yes yes!! I feel the same way about baking bread - it's so calming and I always feel so accomplished!! I think I feel most accomplished when I bake something with yeast. Making bread is so magical. I love that it relaxes you, despite it's high level of difficulty! : ) Way to go!! Hi Monica, these cookies sound like the perfect combo of chocolate and oatmeal. Many times I make half batches too. Otherwise I feel like I have to eat them all. More chocolate is always a good thing haha! These cookies look really superb! I love both chocolate cookies and oatmeal cookies, so together sounds perfect. Thanks - always a good day to make a batch of cookies. Talk about comfort food. I always adore your cookie recipes and these are no exception. Love how they are bursting with the goodness of chocolate and oatmeal. Can't wait to try them with my daughter. Thanks so much; it's nice to fill the cookie jar with some homemade cookies and oatmeal ones are so good. You and your daughter enjoy all the precious time in the kitchen together! I LOVE your philosophy about adding more chocolate to chocolate. These cookies sound incredible plus their choclatey, chewy appearance makes them a winning combination. I need all the chocolate!! These cookies are calling out my name! I don't think I've ever had a chocolate oatmeal cookie and boy do these sound like a good one to try. Same here...these were definitely nice and I'd be happy to have one any day.